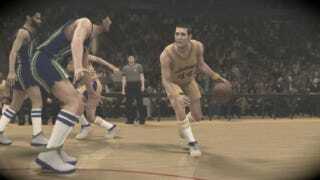 NBA 2K12 yesterday revealed its roster of 15 all-time greats appearing in the game, a constellation of the top performers spanning the professional game's history. But as these players will appear with their teammates and face rivals from that era, there is an even longer list of great names, some making a rare appearance in a video game. Thanks to last year's "Jordan Challenge", NBA 2K11 was able to sneak in George "The Iceman" Gervin, one of the ABA's all-time greatest gunslingers and, at the end of his career, a teammate of Jordan's on the 1986 Chicago Bulls. The same spirit pervades the selection of this year's supporting cast, offering a chance to play as some of the game's most electrifying performers, renowned specialists, and fan favorites. So I've added another list of 10 hidden gems who should make the game worth picking up, especially for diehard fans. The stipulations for inclusion here are that the players cannot be one of the 15 legends getting top billing in the "NBA's Greatest" mode, of course, and cannot have appeared in NBA 2K11. That means guys like Dominique Wilkins, John Starks and Shawn Kemp, while entertaining performers, don't make the list here, as we already saw them last year. The deadliest shooter in the history of the sport. If Maravich is not rated 99 in every shooting attribute I will eat my controller. Matching the 1971 Lakers against the Hawks is a brilliant move deliberately meant to get Maravich into the game. There will be a lot of people who come to know the '71 Hawks—and UCLA great Walt Hazzard (16.5 ppg)—simply because they want to play as Pistol Pete. His spiritual heir at LSU, Mahmoud Abdul-Rauf (born Chris Jackson), is on the 1994 Denver Nuggets in this game. Though they did not win the NBA title in this year, most of these players were on the team that did in 1973 and in 1970, when an injured Willis Reed made his fabled entrance into Game Seven of the Finals. The 1972 Knicks also feature the stylish Walt "Clyde" Frazier, known for his rhymings as the Knicks' current color commentator. Earl "The Pearl" Monroe, the pride of Winston-Salem State, stands as a worthy tribute to the NBA's great stars from historically black colleges. Bill Bradley? When's the last time you played a U.S. senator? Off the bench is some guy named Phil Jackson. This team alone justifies the $60 price tag. A role player appearing in just 14 games for The Bad Boys, bringing the 1989 Pistons to the game allows 2K to bring us, all the way from the Planet Lovetron, Chocolate Thunder, one of the NBA's all-time greatest characters and the author of the original shattered-backboard dunk. Although in the final season of his career, it wouldn't shock me to see them give Dawkins a stratospheric dunk attribute purely out of nostalgia. This probably also means he's available in the game's Blacktop Dunk Contest. If so, watch out for an arsenal that includes the Rim Wrecker, the Go-Rilla, the Look Out Below, the In-Your-Face Disgrace, the Cover Your Head, the Yo-Mama, the Spine-Chiller Supreme and the grandaddy of them all, The Chocolate-Thunder-Flying, Robinzine-Crying, Teeth-Shaking, Glass-Breaking, Rump-Roasting, Bun-Toasting, Wham-Bam, Glass-Breaker-I-Am-Jam. This game gives a Big Red chewing-gum kiss to the long-suffering, often ignored fans of the Milwaukee Bucks, including the franchise's greatest ever team, the 1971 world champions of Robertson and Alcindor, and then totally at random, the 1985 unit featuring Terry Cummings, Craig Hodges, and Sidney Moncrief. One of the NBA's most underrated all-around players, Super Sid boasted a 36-inch vertical and was a bloodhound on defense. Moncrief's best year was 1985, coming off consecutive Defensive Player of the Year honors (including the first ever awarded) and a 1983 postseason in which he and the Bucks swept Larry Bird and the Celtics right the hell out of the playoffs. His No. 4 is retired at Milwaukee. Emerging as a sixth-man mainstay on the Alonzo Mourning/Larry Johnson teams of the mid-1990s, the sight of Dell Curry alone on the wing panicked a generation of defenders. Teammate Muggsy Bogues, the shortest NBA player ever, will also be a trip to play with, but I'm going with Mister Hornet, the longest-tenured of those from Charlotte's original 1988 roster. Over a four-year span, Curry averaged 15 points and shot 45 percent from the three-point line, not once starting a game. With a jumper as pure as first love, if you ever see Dell Curry subbed in, know that the ball is going to him. Oh my God. Before Chris Paul, Tim Duncan or Randolph Childress, there was Rodney Rogers, the most fearsome Demon Deacon ever. This is his rookie year with Denver, so you will get him with limitless potential. On Feb. 8, 1994, Rogers buried three 3-pointers in nine seconds to bring the Nuggets back from a 94-86 deficit to a 95-94 lead against the Jazz. His dunk rating should also be through the roof. A tragic motorcycle accident in 2008 left Rogers paralyzed from the shoulders down, making his inclusion here, when his future was so bright, poignant indeed. For a time, Hardaway looked like a certain hall-of-famer, too. Paired with Shaquille O'Neal in Orlando, Hardaway averaged 20 points, 7 assists and shot 50 percent for a Magic team that thundered to the NBA Finals and handed Michael Jordan his last playoff exit. Yes, a lot of attention will be on Shaq, but in just about anyone's hands Hardaway will become a multifaceted threat running one of the most dynamic offenses in the entire game. Like Mullin, Baylor is no one's idea of an overlooked player, but a first glance suggests this may be the first video game appearance ever for one of the most luminious stars of the NBA's early days. Probably the greatest North American athlete never to win a championship, across all sports, Baylor posted some unbelievable numbers for his era—including hanging 61 points on Boston in Game Five of the 1962 Finals, a record that still stands. If there's a 16th Legend on this list, it's Baylor, who arguably merits inclusion if not for the fact contemporaries Jerry West and Wilt Chamberlain are already on it. One of the NBA's finest defenders ever, Cooper should have absolute lockdown ratings in that department. In 1996, the Lakers called him back to L.A. to work out a young prospect named Kobe Bryant. Quoting now from "The Art of a Beautiful Game," by Sports Illustrated's Chris Ballard: "Cooper is 40 years old but still in great shape, wiry and long and much stronger than the teenage Bryant. The game is not even close. ... After 10 minutes, [Jerry] West stands up. 'That's it, I've seen enough,' he says. 'He's better than anyone we've got on the team right now. Let's go.' " With Cooper and Bryant from the 1998 Lakers, you can recreate one of the most important, and unknown, one-on-one duels in NBA history. With the Magic in 1995, Clemson's Shade Tree was in the final year of an 18-year career known for "The Trillion," a box score line of one minute played and nothing else—12 zeroes, reading 1,000,000,000,000 all the way across. Tree registered an unofficial record 14 of them. Two years ago I proposed that NBA 2K make getting a Trillion a secret achievement. Though I have no information that will happen, if we've come this far I can't see why the 2K Sports gang wouldn't want to. It&apos;s Not in the Game — Should it Be?